This Mediterranean Chicken Dinner utilizes a variety of Mediterranean seasonings and American techniques to create a delicious cross-over meal that my family loved. Each bite has alluring flavors, intriguing and tempting you to take another. Before you know it all the chicken is gone and you are longing for more! A touch of spice from harissa powder (not the paste), robust cumin, haunting saffron, sumac with its bright, lemony flavor, and the warmth of cardamom and allspice all combine for something that will have your guests wondering what you used and begging for the recipe. Most of the seasonings you probably already have but some may be new to you. They are really fun to play with and favorites of the best chefs in the country. Give them a try and you may be surprised how they show up in a bunch of your tried and true recipes, giving them a little kick in the arm. I rarely measure when I am cooking – unlike baking where I am very careful – and I have included the approximate measurements for the seasonings as a starting point. I lightly sprinkled them onto the chicken. Please add them to your personal taste and feel free to leave something out if you don’t like it or don’t want to make a special run to the grocery store. Recipes are just guidelines, you make them your own with your creativity. Couscous is often the traditional choice to accompany Mediterranean meals but I used rice for a gluten-free alternative. Adding a touch of saffron gives the rice a beautiful golden hue and lovely delicate floral notes. I also added a little cardamom and allspice to carry on the Mediterranean flavors and create the perfect bed for your chicken. Enjoy a virtual trip to the warmth of North Africa and nearby countries with each bite of this Mediterranean Chicken Dinner! Be sure you use spices that are guaranteed gluten-free. If you are in doubt, contact the manufacturer to check their processing practices and safety checks. Green vegetables such as broccoli, beans, zucchini, etc. Cook the Rice: Place the rice, water, salt, and butter in a medium saucepan. Stir the saffron, cardamom, and allspice into the water and cook as directed on the package. When done, rake the rice with two forks to break up any clumps and to distribute the saffron rice. 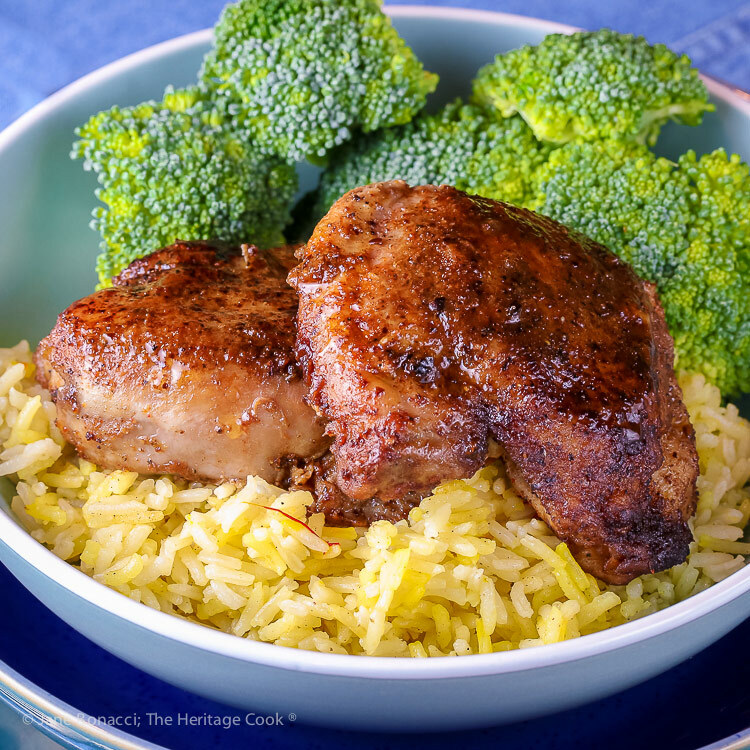 Make the Chicken: While the rice is cooking, heat the oil in a large skillet. Add the chicken pieces leaving room between each. Sprinkle with the seasonings, cook over medium-high heat until cooked through, at least 165°F in the center on an instant read thermometer, about 5 to 10 minutes. To Serve: Scoop a portion of rice onto each plate and top with one to two pieces of the chicken. Sprinkle the top with parsley, add your choice of vegetables, and serve immediately. Yummmmmmy! Thanks for sharing, I will cook it this week! Hi Kathy, thanks for your kind words. I hope you love this meal as much as we did!